Back in 1977, DC Comics published the first issue of Shade, The Changing Man, featuring a new adventurer created by the legendary Steve Ditko. Shade grew to become one of the trippiest heroes ever published by DC, eventually returning in a series that helped lay the foundation for the groundbreaking Vertigo imprint. Now anew series morphs Shade’s newest form is the most complicated one yet: a teenage girl. 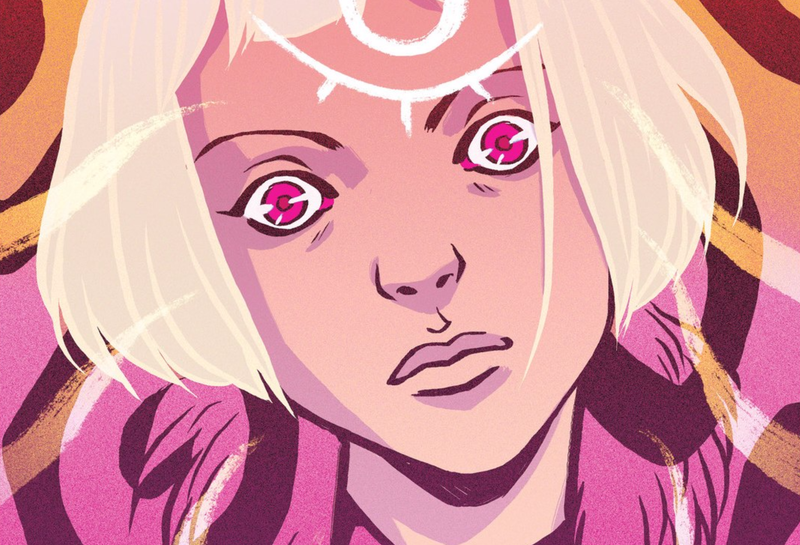 Last week saw the debut of Shade, The Changing Girl, written by Cecil Castellucci with art by Marley Zarcone, Kelly Fitzpatrick and Zaida Temofonte. In the first issue, an extradimensional alien named Loma steals the perception-warping meta-coat worn by now-dead former lead character Rac Shade and comes to Earth in search of big feelings. She winds up inhabiting the body of comatose Megan Boyer, a high-school sophomore who was the main mean girl in a small suburban town. Loma doesn’t know anything about being human and her education will come at the hands of Megan’s parents and frenemies, all of whom thought the girl who scared them was gone for good. I talked to Castellucci during this year’s Comic-Con in San Diego, months before the series debut. During the chat that follows, the author of Moving Target: A Princess Leia Adventure, The Plain Janes, and The Year of Beasts talks about how she’s planning to nod at previous versions of Shade and why she loves writing adolescent characters. io9: You’ve worked in comics before but this is first time that you’ve tackled an ongoing series. What’s different about working in this format? Cecil Castellucci: I’m in love with stories, and I’m in love with telling stories. The interesting challenge as a person who’s done one-and-done books and comic books is the pleasure of discovering the longer term and getting really deep into the micro-way with the character, which I’ve never gotten to do before. Maybe I have a lot of pages when I’m doing a novel, but I’m a pretty lean writer when I write my books. I think what is the most exciting—I want to say, “challenge and pleasure”—is really getting to go deep with a character. Shade is just amazing. She’s an incredible character to get deep with. She’s crazy. Castellucci: I don’t want to spoil too much. But I will say I’m familiar with Ditko and Milligan and I’m definitely trying to pluck little things so that there are echoes that Shade fans will be able to go, “Oh, I see what she did there.” But people who have never read Shade don’t ever have to have read any of the other versions of Shade to enjoy our book. How did you first get involved with Gerard Way’s new Young Animal imprint? What I do is I check in with them every once in a while. We go for coffee sometimes. I say, “All right. Here’s what I’m thinking,” like two artists jamming out a story. It’s nice because I feel like he’s my captain but I get to steer my own ship, if that makes any sense. Castellucci: What I can say is that she is an alien from Meta, who wears the coat and goes to earth and inhabits the body of a 16-year-old girl, who was the biggest bully in her school. Now she has to navigate a life with those consequences because everybody pretty much hates her and fears her. And that’s not the life that she has led. It’s interesting because Rac Shade is a man and he is a grown man. The alien is not a 16-year-old girl, but she is in the body of a 16-year-old girl. What I’m interested in with that is the idea that when we’re teenagers, we kind of feel like aliens. So this is an actual alien experiencing teenage-hood. In your work, portrayals of young women have been a recurring theme. Do you feel like you still need to be preaching that gospel, actualizing these voices and bringing them to the forefront? Do you feel like there’s a certain amount of perpetual momentum for you in this pursuit? Castellucci: I don’t know how to answer that question so I’m going to answer it like this: I love writing teenagers because I feel like they’re the most raw characters that you can possibly write. Everything is the first time. There’s never a “now I’m done.” It’s an endless kind of thing. I actually feel like we as adults feel like that too. I feel like through the seasons of our life we have different moments where we have to reinvent and feel raw and stuff like that. I feel like it’s the purest human form.